As debuts go... — The Old Town Alchemy Co.
A lot of new products hit the market every year; a most recent online edition of CLASS contained 22 reviews of new products and sometimes it feels like you can't turn around without encountering a new gin with some previously unused botanical, or a new single malt expression finished in a succession of different barrels. But if there's one category that hasn't seen explosive growth in recent years, it's aperitif liqueurs. Products are often rediscovered or introduced to new markets, but it's an area that's long been dominated by a handful of brands and that makes the decision to take on the likes of Campari and Aperol an interesting one for a first foray into spirit/liqueur production. Alex Kammerling is well-known in the UK bar industry thanks to a long stint as Grey Goose's brand ambassador on these shores and his recently re-brandedKamm & Sons Ginseng Spirit represents his first attempt at entering the marketplace. Alex describes it as "a cross between gin, bitters and a liqueur", produced by distilling 45 botanicals (including four different varieties of ginseng root along with juniper berries, echinacea, gingko biloba and goji berry) in grain spirit and mixing that distillate with a herbal infusion containing manuka honey, wormwood and gentian. The light amber colour comes from annato seeds and with responsible service and consumption of alcohol being a thing these days, the liqueur comes in at 33% ABV. Kamm & Sons is definitely reminiscent of a particular style of slightly sweeter amaro; it has some really interest herbal notes throughout shot through with a hit of citrus and while it is sweet, it's not cloying. There is definitely some bitterness on the palate - which as a general fan of amaro, I fully support - but it doesn't dominate: it can be deployed as a stealthy means of introducing the idea of bitterness as a desirable flavour to those who maybe might otherwise avoid it. I've found some mileage in using it in place of Campari here and there - using the Negroni formula with Kamm & Sons, Sipsmith Gin, and Lillet Blanc is the basis for awesome - but also in using it as a base ingredient in café style cocktails (some vermouth or similar, a liqueur, something fizzy - lower on the ABV but still super tasty) and as a modifier in fun, refreshing sour style cocktails. Shake all ingredients with ice and fine-strain into a chilled stemmed glass. Garnish with a twist of grapefruit zest. I've met Alex a couple of times and he's always blown me away with his attention to detail as a bartender and as an ambassador, so it isn't surprising that he'd come up with something so versatile and inviting. He's on record as saying that one of his favourite aspects of tending bar was creating things and Kamm & Sons is one of his creations that he's proudest of. For me, it's always fun to play with new stuff, particularly if it's in an area that doesn't often see a lot of innovation so it's exciting to see a new independent producer taking on that kind of challenge. 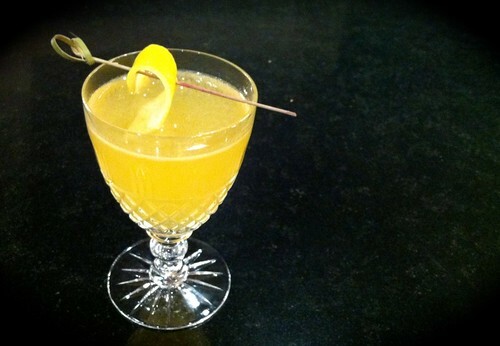 Posted on March 5, 2012 by Jon and filed under Mixology, Recipes and tagged Alex Kammerling cocktails Cointreau Kamm & Sons liqueurs triple sec vodka.